Taking place during the rice planting season in Northern Italy's Po Valley, Bitter Rice sympathetically follows the plight of dozens of women who make the annual pilgrimage to harvest the existing crops and deposit new plants (a job ideally suited for delicate female hands). • Giuseppe De Santis (2008) - this documentary film was produced by Carlo Lizzanni, who was one of the writers that worked on the script for Bitter Rice. (Carlo Lizzanni also had a prolific career as a director. His directing credits include such films as Wake Up and Kill, Requiescant, Love in the City, and Kleinhoff Hotel). 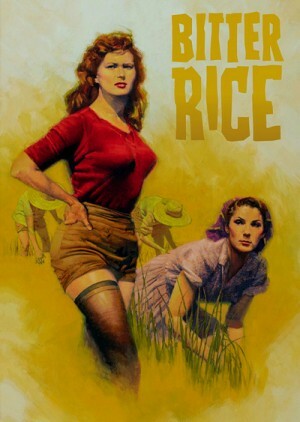 The film takes a closer look at the life and legacy of Giuseppe De Santis and the production history and success of Bitter Rice. Included in it are clips from archival interviews with Carlo Lizzani, Giuseppe De Santis, director Ettore Scola (A Special Day), and actors Sabrina Ferilli (The Great Beauty), Lino Capolicchio (The Garden of the Finzi Contini), Francesca Neri (The Ages of Lulu, Hannibal), and Massimo Girotti (Facing Windows), amongst others. In Italian, with optional English subtitles. (53 min, 1080i). • Carlo Lizzani - in this archival video interview, Carlo Lizzani recalls how he became involved with Bitter Rice, and discusses the casting process and the shooting of the film. In Italian, with optional English subtitles. (7 min, 1080i). • Trailer - original Italian trailer for Bitter Rice. In Italian, with optional English subtitles. (4 min, 1080p).